The first sunset from our rooftop over the Pacific Ocean. 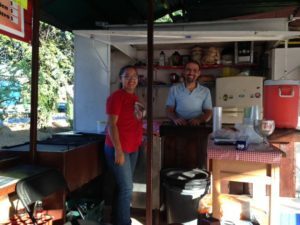 Juan Carlos Bernal and me, our first day in PV. 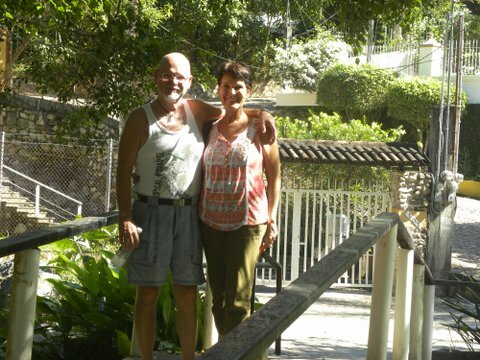 Jim and I flew to Mexico City from Cancun and then on to Puerto Vallarta to be met by our friend Juan Carlos who used to work in Playa del Carmen but is in PV now. 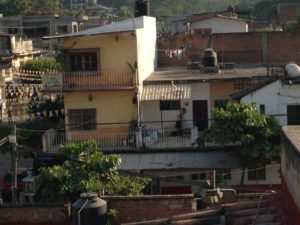 He lives in a 3 bedroom apartment on the top floor in the Agua Azul neighborhood northeast of the central zone. We climbed to the roof to see our first sunset over the Pacific in a long time. 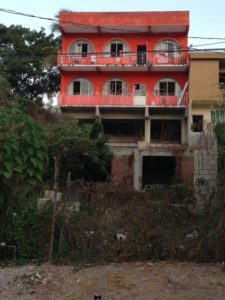 Then into old town, La Romantica, for a dance show, a walk on the malecon where we ate shrimp tacos from a cart and had maracula (passion fruit) water ice. Up early the next morning to walk around the neighborhood. All streets are made of cobblestones as the many rivers that flow through town bring them from the Sierra Madre mountains which are very near. 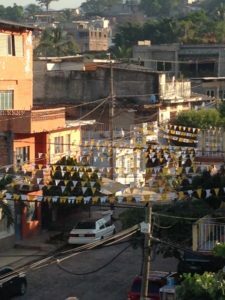 From the rooftop I saw the carnitas man stirring his caldron of boiling oil into which he placed pieces of pork. People stood waiting for the finished product and held newspaper ready to receive their choice bits. It was all gone in minutes. The carnitas man stirring his pot of boiling oil in which he cooks pieces of pork. 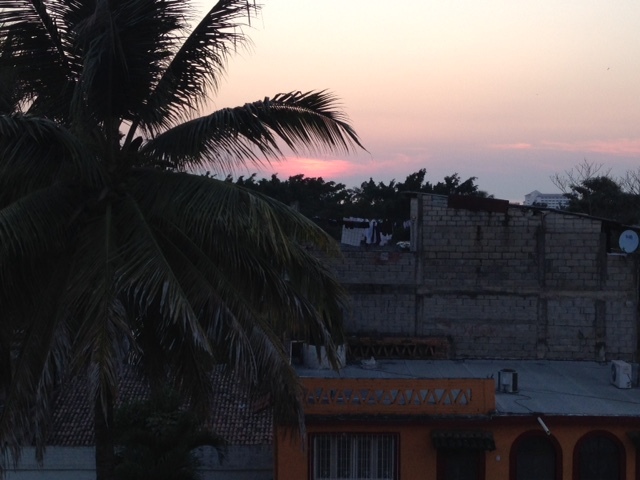 Early morning from our rooftop in Agua Azul neighborhood. 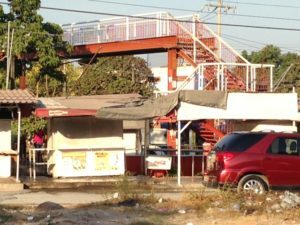 The pedestrian bridge over the highway which takes us to old city, La Romantica. Breakfast of tacos and Nescafe in a neighborhood cafe. 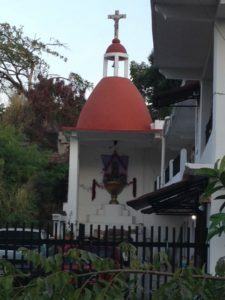 Shrine behind a house in Agua Azul. The street below our room in Juan Carlos’s apartment. 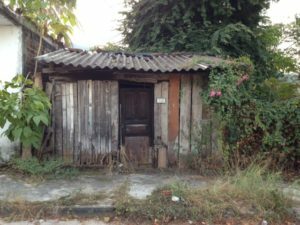 Then on to the small towns along the northern coast of Bahia de Banderas, the huge bay on which Puerto Vallarta is located. 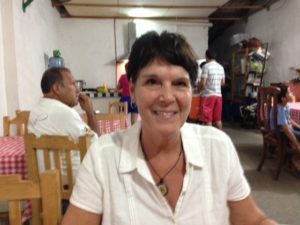 We stopped for lunch in Bucerias and walked through the market where I found a lovely purple dress with bright patterning. 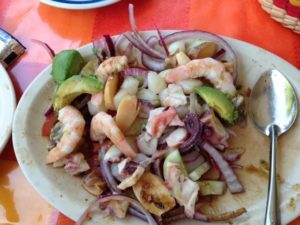 We shared an ensalada de mariscos that was large enough for us both and cost 150 pesos: scallops, shrimp, oysters, conch, octopus, cucumber, red onion, avocado in a very spicy salsa. 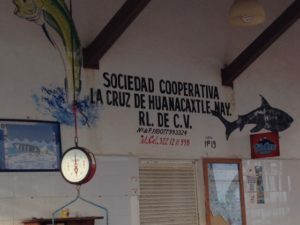 Next was La Cruz de Huancaxtle, a true fishing village, the odor of fresh fish was everywhere. 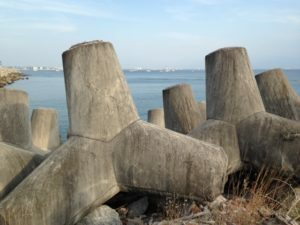 This is nearer to the opening of the bay and to prevent erosion huge cement ground savers, 10 feet tall, have been placed along the opening to the marina. 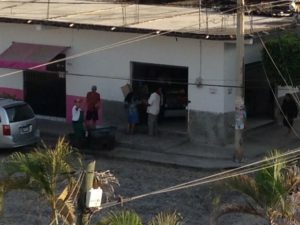 We watched fishermen unload the catch of the day, plenty of red snapper which was sold in the fish market and stored in the co-op refrigerators. Juan Carlos needed to get back to the shop for the evening so Jim and I went for dinner at the local diner which is located in a family living room and opens only Saturday and Sunday 4 – 12 pm. 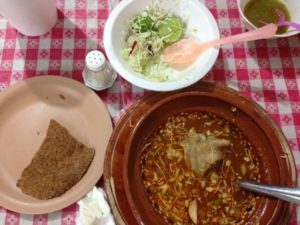 I had a huge bowl of pozole, rich broth with a pork chop, a pig nuckle, shredded chicken and hominy topped with raw onions, radishes,lettuce and lime juice. A good start to the trip. Today we will take the public bus into La Romantica in which many roads are closed due to the pilgrims arriving at the Cathedral for the celebration of the Virgin de Guadalupe, Dec. 12. Ensalada de Mariscos: scallops, shrimp, conch, octopus, oysters mixed with cucumber, red onion, avocado and a very spicy salsa. 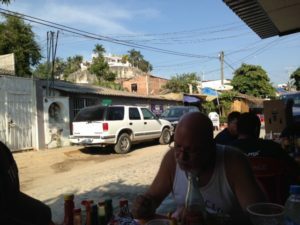 Lunch in Bucerias with Juan Carlos. 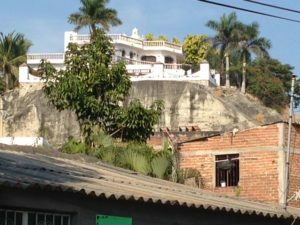 House above Bucerias on a cliff sealed with poured cement. Ground saving totems along the shoreline in La Cruz de Huanacaxtle. 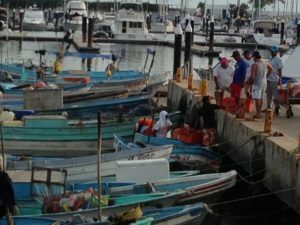 Fishermen unloading beautiful red snapper to the fishing co-op refrigerator. 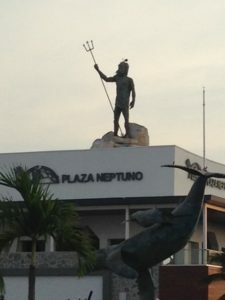 Neptune keeping watch over the sea. Me at dinner of pozole in neighborhood cafe. Pozole for dinner with all the trimmings.